Sepsis Alliance, the nation’s leading sepsis patient advocacy group, has launched a new marketing campaign in PGA TOUR Magazine. The ad, appearing in both web and print, is a collaboration between Sepsis Alliance and Begin Again Foundation, featuring the Leishman family as they recount Audrey Leishman’s struggle against sepsis. San Diego, CA – Sepsis Alliance is pleased to announce the launch of a new sepsis awareness campaign in PGA TOUR Magazine. The initiative is a collaboration between Sepsis Alliance and Begin Again Foundation, and features professional golfer Marc Leishman, his wife Audrey, and sons Oliver and Harvey. 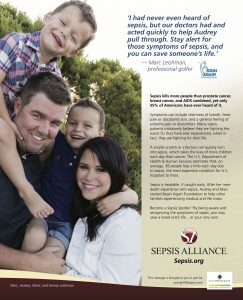 The campaign was inspired by Audrey’s dramatic fight for survival against sepsis. In 2015, Audrey developed toxic shock syndrome (TSS), which quickly cascaded into sepsis. As she fought for her life, Audrey’s doctors did not know if she would survive. Her husband, who had been getting ready to play in the Masters Tournament, officially withdrew from competition and raced home to be by her side. After being in a coma for five days, Audrey survived, but continues to suffer from some lasting effects from sepsis, such as fatigue and weakness. After her close brush with death, Marc and Audrey realized that they had an opportunity to help others who had gone through similar trauma. Together, they started the Begin Again Foundation to assist survivors of sepsis, TSS, and ARDS with one-time grants that could be used towards meeting these patient’s most pressing needs. For their tireless work in giving back to the community, the Begin Again Foundation was the first-ever recipient of Sepsis Alliance’s Erin Kay Flatley Spirit Award in 2016. The campaign is taking place exclusively in PGA TOUR Magazine, and will be included in 10 million copies of the publication. In addition, a banner ad featuring the Leishmans will run on the magazine’s website. Major funding for the campaign was provided by bioMérieux, as well as individual donors who wished to support the organization’s first major nationwide advertising initiative. Next Next post: Bec T.